Do you understand why people follow you on Twitter? Well, for one, I have zero interest in or love for the user’s product and even less in the user’s Twitter stream. 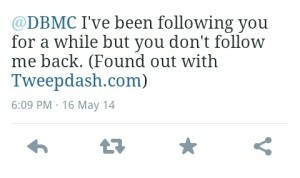 Also, this user has never, ever interacted with me on Twitter other than to follow me (meaning that he/she/it? has not ever re-tweeted anything, or asked me a question, or anything). So, in Tweepdash language, this user has not shown any love for me. Lastly, I don’t automatically follow anybody back. Follow people and organizations with whom/which I have a personal connection. Follow those with good content in areas that I am interested in (read my profile on Twitter if you want to see what some of those are). Follow journalists who cover subjects I am interested in. Why do people follow specific Twitter users? Because they are getting something out of it; whether it be information, furthering a connection or sharing an interest. 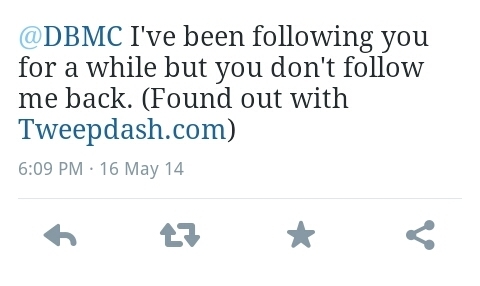 Following people just to get them to follow you is not a good Twitter strategy. It shows that you don’t understand why people use Twitter. It shows that you think all you have to do is show up to the party. But hey, if you’ve ever been to a large party, you know just showing up and not talking to other people or being uninterested and/or uninteresting will lead to you being all alone. The bottom line is if you are trying to build a Twitter following, start by understanding why people would follow you on Twitter. What are your thoughts? Do you automatically follow back? Would you block users you don’t care for? And finally, what would you do with the tweet I got? Is Twitter a High School for Adults?